By making your own food at home, you can save money and you'll always know exactly what is going into your baby's body. Foods prepared at home will last in your freezer for about one month. Thoroughly wash any fresh vegetables or fruits that you've purchased in the produce section to remove dirt and possible pesticides. Steam or boil the fruit or vegetable. You will want the food to be mushy if your baby has just started on solids. If your baby has been eating for a couple of months you can cook the food until it is easily pierced with a fork to allow a thicker consistency. 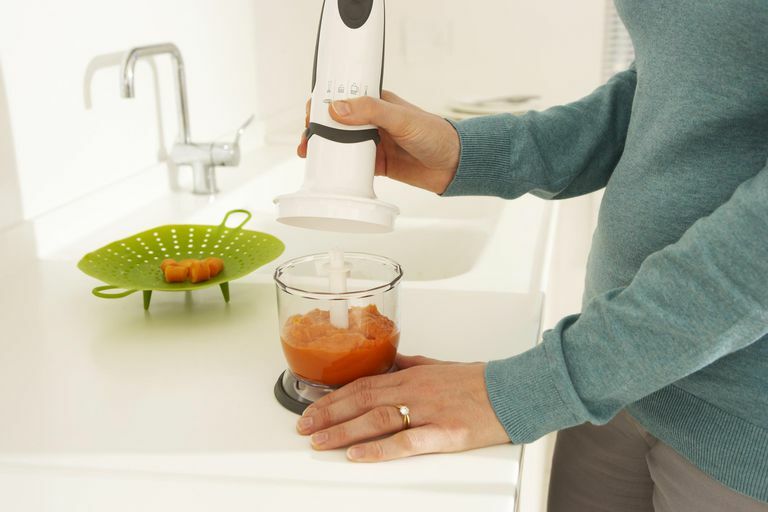 Puree the food in a blender or food processor, or process with a food mill until the food reaches the right consistency for your child's stage of eating. Strain the food to remove any stray peels. Alternately, before cooking food, you can remove the peels at that time to avoid this step. Spoon the pureed food into ice cube trays and cover with plastic wrap and place in the freezer. When the cubes are frozen, you can put them in zip lock bags or another food storage container. Be sure to label with the type of food and the date it was prepared. When it's time to eat, remove as many cubes as you need and allow to thaw or thaw in the microwave. Fresh fruits and vegetables are always best, but you can also use frozen or canned. Canned fruits are especially good to use when fresh fruits are out of season. When your baby is just beginning to eat solids, remember to introduce only one food at a time to identify possible allergies. As your child gets older and you know which foods have been tolerated well, you can start to blend two or three different fruits or vegetables together. Use a few additives such as salt, sugar, or preservatives. Your baby doesn't need them, and some such as lemon juice can cause an allergic reaction in very young babies. Some fruits do not need to be steamed or cooked, such as kiwi fruit and bananas. Some good fruits and vegetables to start out with are apples, plums, pears, apricots, peaches, bananas, carrots, peas, green beans, butternut squash, and sweet potatoes.